Stillingia is a perennial herb in the spurge family that is native to the southeastern panhandle coastal regions of the U.S. and the Pine Barrens stretching from Florida to Virginia, as well as parts of Colorado. Also known as queen’s root and queen’s delight, the herb was used by various Native American tribes, including the Muscogee (Creek Nation) of Oklahoma. The dried herb is used to produces teas, tinctures, salves, ointments and other topical preparations. Stillingia sylvatica is a perennial herb of the Euphorbiaceae family. This herb's angled glabrous stem can grow up to 4 feet in height. When the plant or root is broken or cut stillingia will exude a milky sap. Its leathery leaves are	sessile, tapering at the base. It bears yellow flowers from April to July in a terminal spike. Stillingia's fruit is a three-grained capsule. The longitudinally-wrinkled grayish brown root grows 1 to 4 inches long and 1 inch or more thick. Under its bark the root is reddish-brown or rose-colored internally. The oleaginous root has a peculiar odor and a unpleasant, bitter taste that is followed by a persistent pungent acridity in mouth and throat. The plant was named for Dr. B. Stillingfleet. Stillingia sylvatica is native to the southern United States of America from Virginia to Florida and westward to Texas. Stillingia grows on sandy prairies, open woods and open ground in full to part sun. Prefers a moist, sandy, well-draining soil. Once the seed capsules turn dark, collect a few, and store them in a brown paper bag where they can dry. When they turn black and are fully ripe, they will split and release their small seeds. Sow them just below the soil surface. Collect stillingia roots in fall. While still fresh, slice the roots length wise and into quarters and dry for later use. Harvest the roots before they are 6	months old—as the quality deteriorates rapidly. The latex in the plant's sap can cause skin to blister so gloves should be worn when handling. Stillingia is a plant that’s been used all over the world to fight various types of infections. It helps to detoxify the body and it can provide relief from inflammation and irritation. It was used by Native Americans to treat skin problems and sexually transmitted infections. In Europe it was used to prevent infections after women gave birth. In modern herbal medicine, stillingia is usually used to remove toxins from the body and restore good health. As you’ll see, it has many uses in the body. Most of those uses revolve around killing off infections that are going on inside the body. If you’re suffering from digestive problems such as constipation, stillingia can help to get the bowels moving again. Instead of using pharmaceutical laxatives that can cause cramping and diarrhea, stillingia will provide a more natural relief. If hemorrhoids are a problem for you, stillingia may bring an end to itching, inflammation, and irritation that often accompany them. 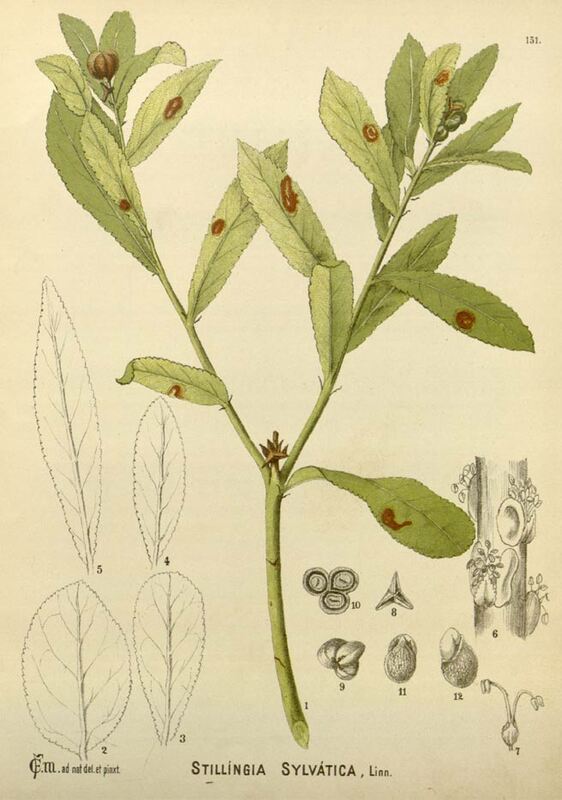 Stillingia can also be used to treat conditions of the skin. If you have eczema, you can take stillingia internally to help reduce the symptoms and restore your skin’s healthy glow. You can also use stillingia to treat boils that cause pain and discomfort. Externally, stillingia can be applied to the skin to decrease inflammation and cool burning skin. If you have an infection in the upper respiratory system, stillingia can fight the infection. You’ll get relief from sore throats, laryngitis, and even bronchitis when you use this herb as part of your treatment program. This can be a great comfort when you’re trying to function in your daily life while battling a minor infection. Sometimes it seems like minor infections cause more of an inconvenience that being very ill.
Stillingia is generally used to remove toxins from the body—whatever they may be. While stillingia has many amazing health benefits, you should know that it could also cause some problems. As with many other herbs, there are side effects if stillingia is taken improperly or in too high of a dose. You should make sure you take it under the supervision of a healthcare provider because it can cause some problems such as vomiting and nausea. When you take the correct dose under supervision, you’ll be unlikely to have this happen. Stillingia root is usually sold as a powder. Refer to a healthcare provider for the correct way to use it and the correct dosage.